The Two-Tone Princess Cut Cubic Zirconia Solitaire Engagement Ring is available in your choice of a 1.5 carat 7mm princess cut or a 2.5 carat 8mm princess cut set in a unique white gold head with additional small princess cut diamond look cubic zirconias that are flush bezel set into the gallery area beneath the center stone. The shank of this 2-tone solitaire ring is featured in solid 14K yellow gold which is a nice contrast to the white gold head and prongs. 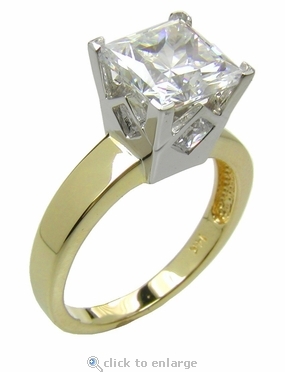 This ring is a modern take on the classic solitaire engagement ring. You can add any band to this unique princess cut solitaire to make your own combination of a wedding or bridal set. 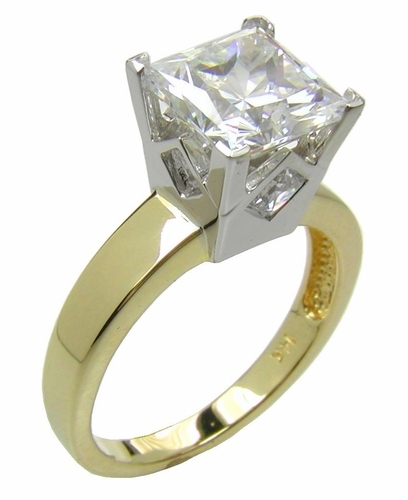 Please note that the 2.5 carat princess cut center stone is offered as an upgrade, see the menu options. Due to extremely low pricing, all clearance sales are final.